The rewards of teaching the Earth sciences at the K-12 level in the United States are great, but sometimes so are the frustrations. At Monday’s education forum, Sandra Henderson touched on some of these issues in a discussion of recent UCAR surveys of K-12 Earth science teachers. UCAR, which supports the professional development of science teachers through their “Windows to the Universe” website and other initiatives, generated almost 1,000 responses from National Earth Science Teachers Association (NESTA) members and newsletter subscribers. While making note of one particularly positive development–that teachers now have reasonably good access to technology and utilize it regularly–Henderson also listed the top 10 concerns of science teachers and summarized the surveys’ findings. So how can these concerns be addressed? American educators might look to their colleagues across the Pacific for a uniquely successful approach to environmental education. In another forum presentation, Michihiko Tonouchi of the Japan Meteorological Business Support Center in Tokyo described a program in Japanese public schools that teaches students about global warming and other environmental issues. A teaching aid used in Japan's elementary environmental class. A popular technique is to compare the warming of the Earth to human illness. 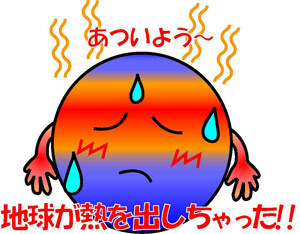 The text in this picture reads "The Earth has a fever!!". Weather studies in Japan are now a compulsory subject for elementary school fifth-graders and those in their second year of junior-high school. In the program described by Tonouchi, approximately 100 broadcast meteorologists from the Weather Caster Network (WCN) and 300 engineers from Sharp share teaching responsibilities, with the broadcasters explaining basic scientific principles of global warming and the engineers discussing mitigation and adaptation strategies. Quizzes and hands-on experiments are an important part of the instruction. Along with global warming, alternative energy and recycling are also studied. A website maintained in conjunction with the program provides a forum for student and teacher feedback, as well as activities, articles, and other resources. Tonouchi noted that both students and teachers have enthusiastically embraced the program, and said that the program’s organizers would like to expand the project to the U.S. and other parts of Asia.